I guess the 3D 5O (3 down, 5 over) in regards to a new chat appearing based on the calendar on hook, line and minker needs to be read a little differently. 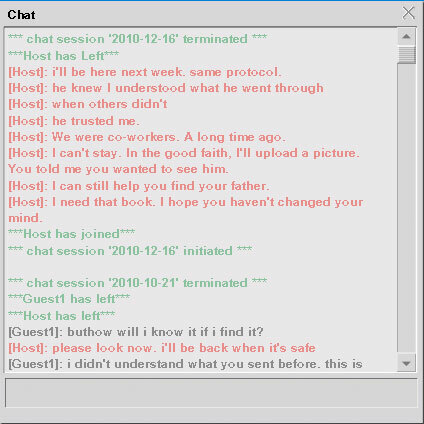 When those instructions were first posted a couple days ago I had determined that the 26th would be when we'd see a new chat, but since this new one appeared yesterday, the 16th, I realized that I've been reading the code wrong. 3D starts in the upper left of the calendar, whether there is a day there or not and moves down to the third row (week of Dec 12th) then the 5O is 5 over including Dec 12th, which lands us exactly on December 16th, which is when the chat was recorded. Hopefully from here on out if there are any more codes I'll be able to correctly pinpoint when the chat logs are going to come through. [Host]: I need that book. I hope you haven't changed your mind. [Host]: I can still help you find your father. [Host]: I can't stay. In the good faith, I'll upload a picture. You told me you wanted to see him. [Host]: We were co-workers. A long time ago. [Host]: i'll be here next week. same protocol. It would be interesting if Minker also thought that it was 3 down from where a date was on that square… if so, then same time next week would be when the Mink man sees this message AND gets to chat directly with his dad’s fishing buddy. I will say that even though we have little or no new clues, they keep bringing up new questions, like: What exactly did Father Minker go through? Some sort of experiment/transformation or more mundane like a divorce. And where was Josh? What’s he doing and why’d he miss the chat? Oops I was looking at the transcript. Good catch, transcript has been updated. I just want to ask what was the password for the new chat window ? Alright. 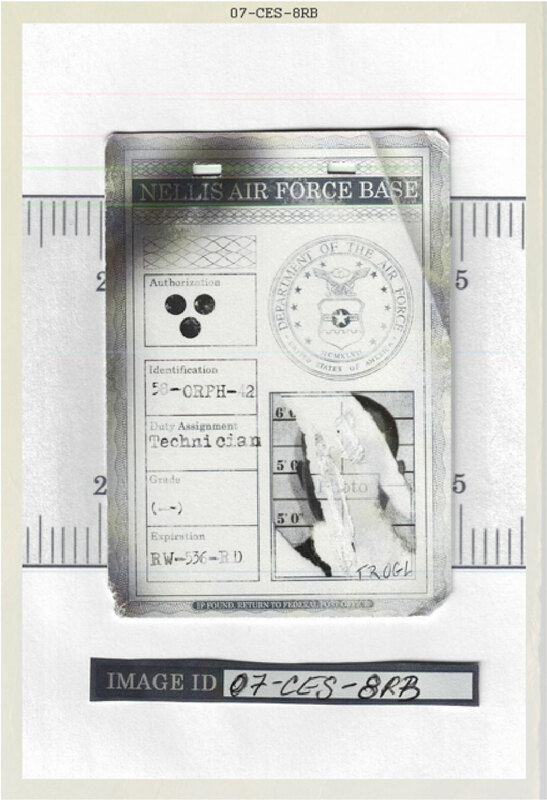 Best theory that I can come up with is that the people in the ID cards include Mysterio and Josh’s dad, because apparently they worked together. Now it’s time to look for that photograph…..
that or he is late and may post on there in the next day or two. Another oneway conversation like mysterios. Maybe it’s to late and something happened to Josh. Maybe someone who wanted the stuff found him first. Yeah it does seems like something happened to Josh during the time hlm was down . After moving everything out of the way on STIES, the “Photos” marcos is referring to is a folder to the right of the Braegen14 and Audio folders. At this time there is only one photo, that of A. Minker, and African American man who looks to be in his late 30s to mid 40s, and presumbably Josh’s father wearing a lab coat with a badge and what appears to be a three dot pin(?) on his lapel, sitting at a table with what appear to be petri dishes in front of him and a hadheld bunsen burner in his right hand, and another gentlemen in a lab coat standing off to his right-hand side. Has anyone found the title of the BOOK, and why is it so important? It looks like a old better home and gardening… “In the GOOD faith” Who gets the family bible. some how this guy had info only the two where able to [ D ] code, and for some reason the choice to keep the Gov. out of the loop was made. It seems they leaned on the two men, and a decision was made to escape before the transfer of materials by mr. M… Look at the ID’s some guys where put on after Minker to take over i assume.